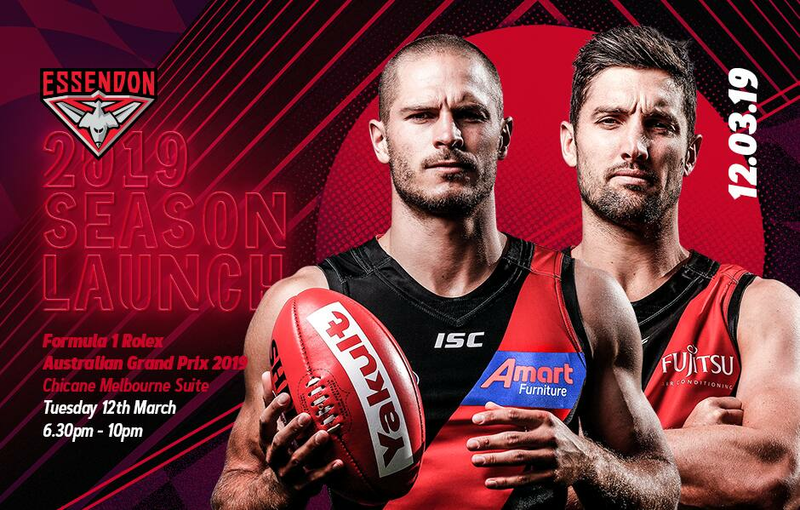 Tickets for Essendon’s upcoming 2019 Season Launch to be held at the Formula 1 Rolex Australian Grand Prix have been released. The event will be held on Tuesday, March 12, presenting fans with the chance to meet and mingle with all of their favourite players and coaches at the exciting new venue. All guests will also receive a General Admission ticket to the Australian Grand Prix on Friday, March 15, and be treated to exceptional cocktail food and beverages courtesy of Treasury Wine Estates and Colonial Brewing Company throughout the event. Premium ticket holders will receive all standard ticket benefits alongside the unique opportunity to take a pre-event exclusive tour behind the scenes of the Formula 1 Rolex Australian Grand Prix with current senior Bombers. Parking: Parking is available at the Village Green (entry via Gate 10 off Canterbury Road) where there will be a meeting point for pick-up and drop-off to and from the venue. Simply use your ticket to enter. Public Transport: If travelling by public transport, entry will be via Gate 1 off Canterbury Rd with a dedicated meeting point for pick-up and drop-off to and from the venue.